We are delighted that as part of our relocation to larger premises we have been able to accommodate a new CBCT machine. Our machine has found its natural home in the original Royal Bank safe- the perfect place to keep you safe from its X-ray! A significant investment in the practice but a game- changer when it comes to modern safe dental implant practice. The two dimensional X-ray has been helpful in the past however the CT’s three dimensional image allows for safer and more predictable procedures. 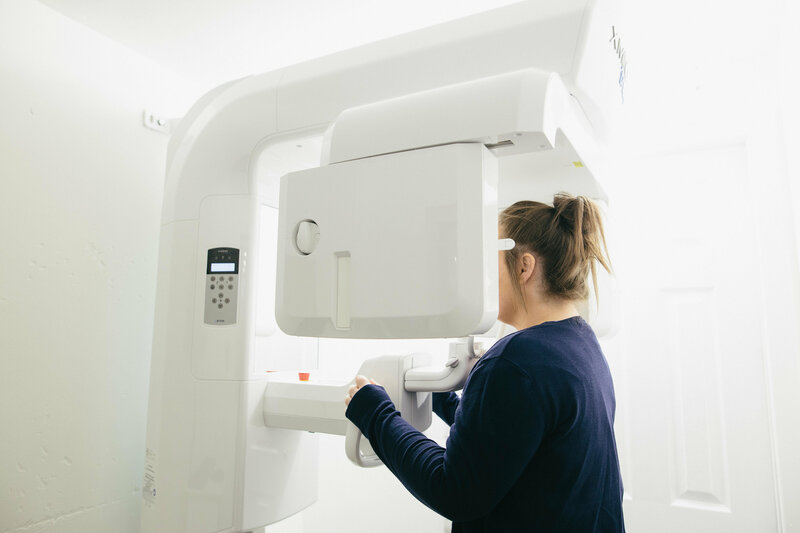 Using the CT image we can plan which size of dental implants should be used and they can be virtually positioned in the image to mimic where we want them to be in the mouth. This helps make procedures simpler safer and more predictable. In most circumstances we can do the entire procedure using the plans and a guiding stent to eliminate the need for scalpels and sutures. Quicker more comfortable surgery, means quicker and easier healing- truly and game-changer!